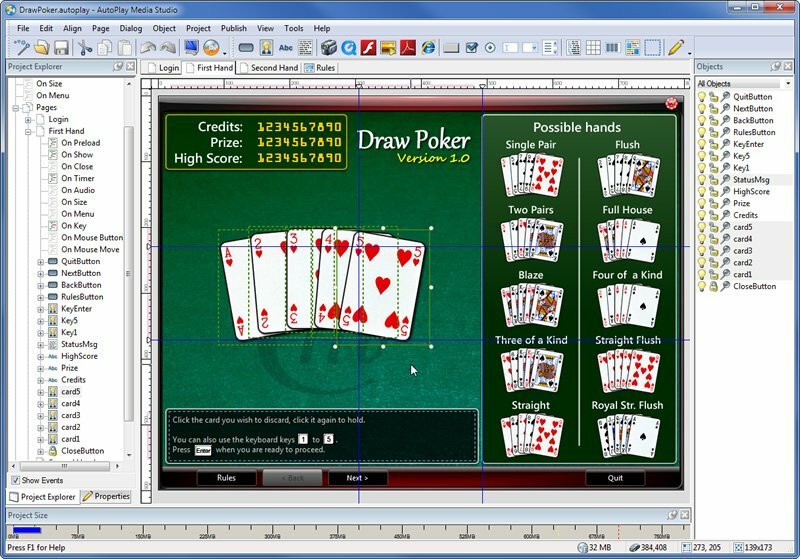 AutoPlay Media Studio's visual rapid application development environment makes software programming faster and eases the software development process. Build multimedia software, business software and application software for use on Windows 7, Vista and XP. Drag and drop technology reduces your software testing and software prototyping burden and increases software quality. Agile software development is easier with AutoPlay Studio's rapid application development environment! Simply drop your videos, images, Flash, HTML, music, text and document files onto Autoplay Media Studio's pages and dialogs and move them into position using your mouse. Once you've created the visual interface, adding in powerful interactivity is a snap. With the Action Wizard, all it takes is a few clicks and a fill-in-the-blanks form. With over 865 high-level actions to choose from, like XML parsing, sending email, running applications, downloading files, browsing web sites, video playback and multi-channel audio mixing, you can develop anything you can think of. The new Lua 5.1 programming language scripting engine opens up limitless possibilities. With full syntax highlighting, code completion, functions and control structures, it's an exceptionally flexible system. It's the perfect software development tool for software developers, network administrators, programmers, consultants, ISV's or anyone creating software or doing software development for Windows.